Gardening is not that easy as one can think, it is adopted as a hobby but it demands you for a regular care! You can even decide to do garden repairs and renovation at a weekend and a potting bench will be a must need to do all garden related tasks! 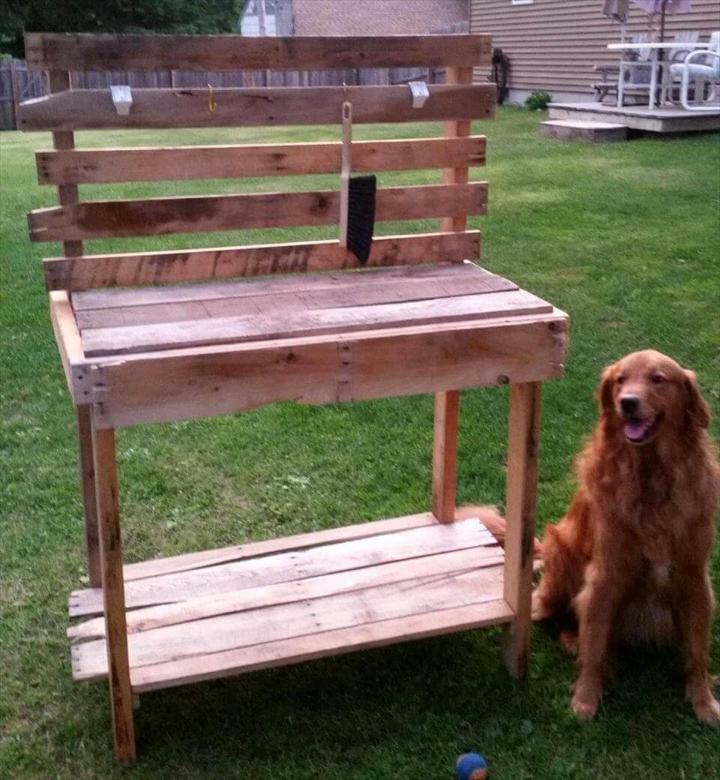 So to make you get with a free of cost gardening table we pickup this exclusive DIY pallet potting bench tutorial, will be a step by step guide for all beginners! Construction is going to be super quick, if you are just having a good stock of single pallet slats! If not having yet, then simple pry the pallet skids to get a big bundle of individual straight wooden lengths! Composing a frame first with precisely and accordingly resized pallet slats, will be recommended here! 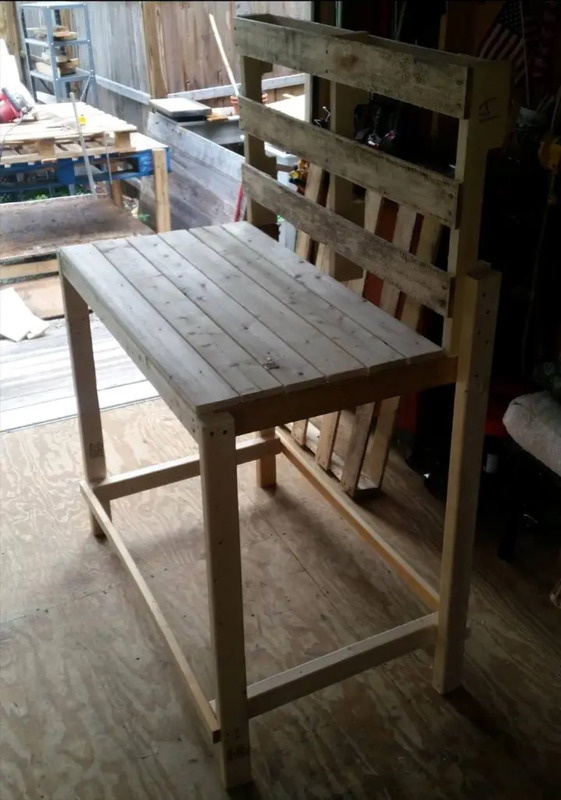 After getting the right frame, one can fill it solid using extra wooden planks, these are basic steps to build this robust potting bench, provides also a lower shelf to store tools and stuff related to gardening! 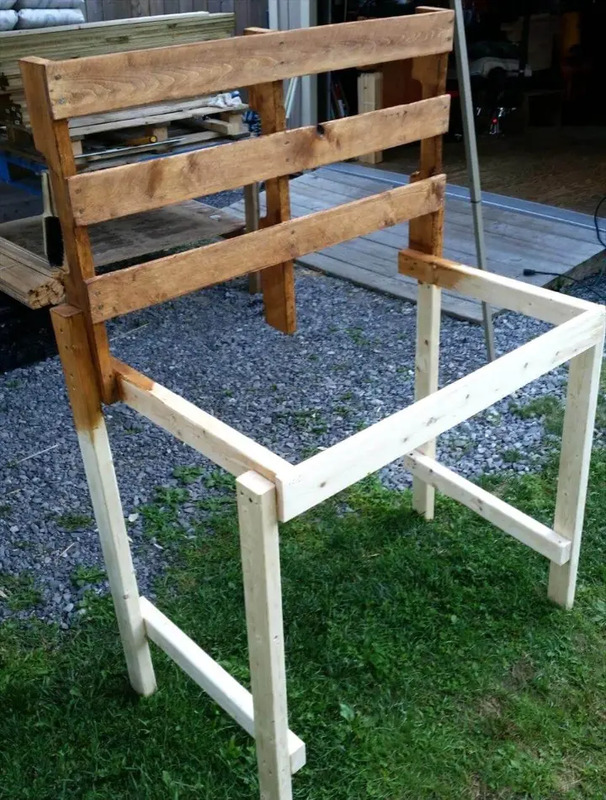 Build first the work-surface of the potting bench, take a start by making a primary base frame including the legs and overall three dimensional sketch for all its parts and features! 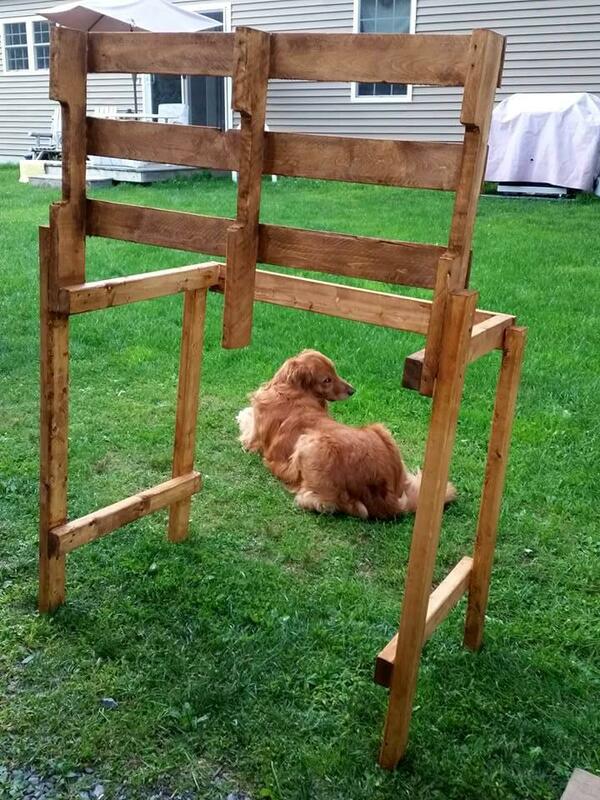 Here the primary skeleton of potting bench has been made by framing up individual slats of pallets, resized according to precisely taken measurements! All planks have been nailed in place! After a complete hand gritting, the frame has been given an Australian Timber Oil finish for glam light brown tone of wood and also for lasting weatherproofing to wooden surfaces! 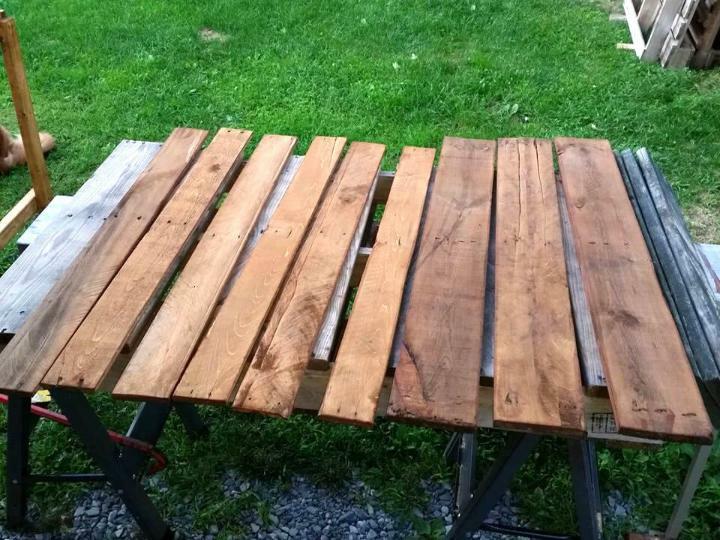 Here a wooden board, made of an altered pallet board, have been installed instead of a wire mesh, you can go with your own preferences! Strip down a bunch of pallets more to get a get big bundle of straight pallet slats you will be needed to fill solid the potting bench frame, here you can see that wooden oil treatment is being given to those separated pallets before getting into construction! 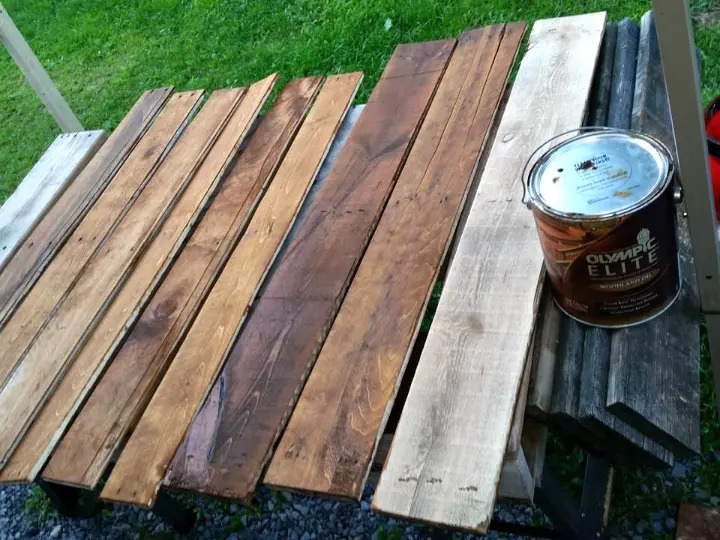 You can add 2 or more coats of wood oil to bring a graceful shine and brightness over the wood grains! These slats have been got here to put flat for work-surface and also for lower shelf of potting bench! 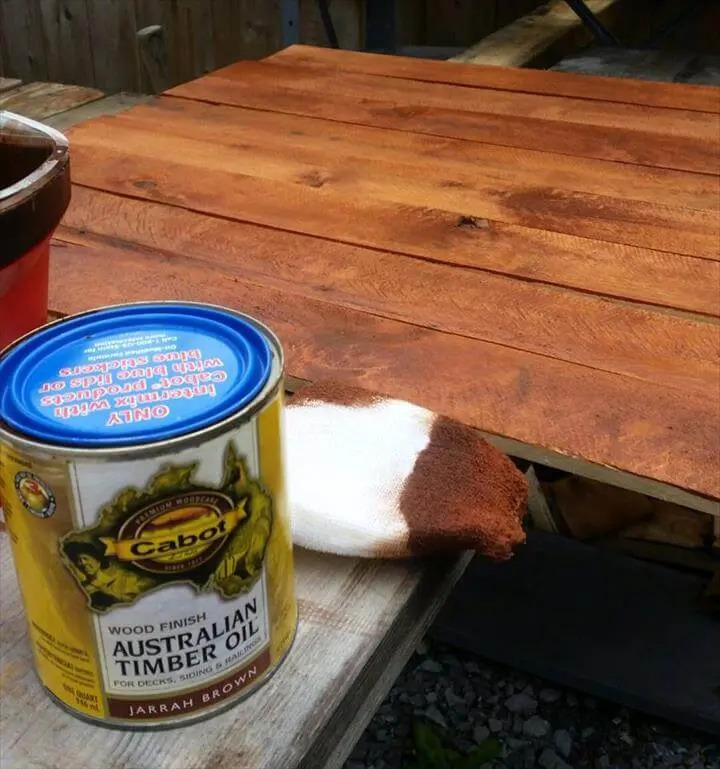 You can even use a piece of foam or cloth to apply the coats of Jarrah Brown Timber Oil, would let the wood withstand even harsh and extreme conditions of weather! Insert the bottom shelf and here is how it will look like at the end, you can even add multiple shelves to top board to display the colorful pots of your garden! 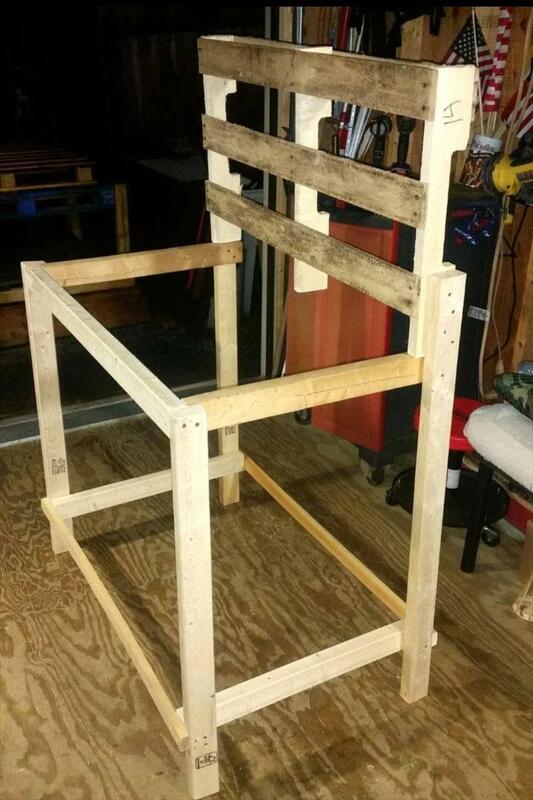 Lower shelf is what here that makes the entire hand-built potting bench storage-friendly! Can be preferred to store garden hose pipe, potting soil, brand-new and repairable pots and also custom tools for gardening! You can prefer any from tons of shades of wood oil or wood stain if you are to vary the tone of wood to special one you like very much! 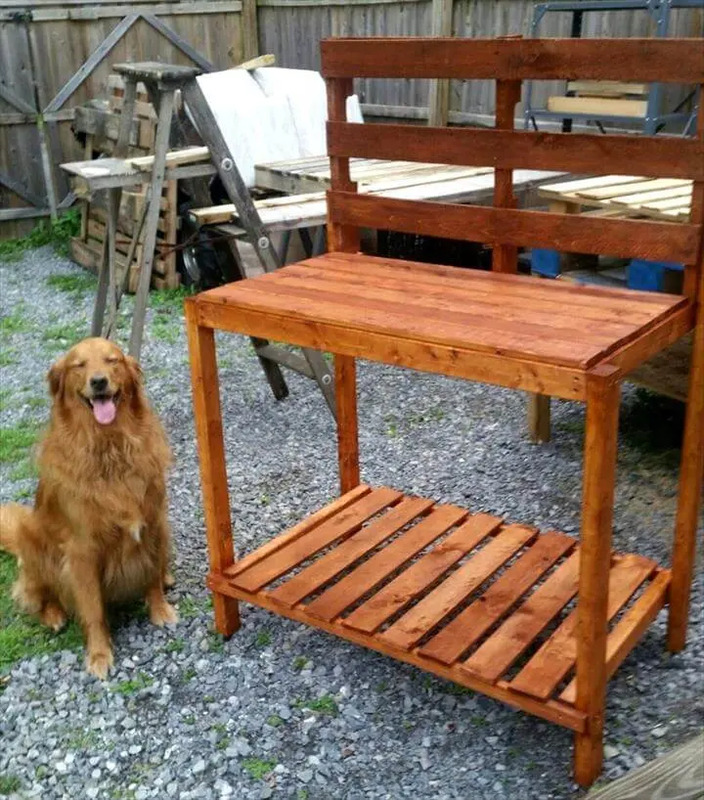 After a durable finish, this potting bench would be all ready to add to your green space! It can even be left unfinished for a precious blank natural tone of wood and here is an excellent preview of it! There is too much more to do with this potting bench for an enhanced character! 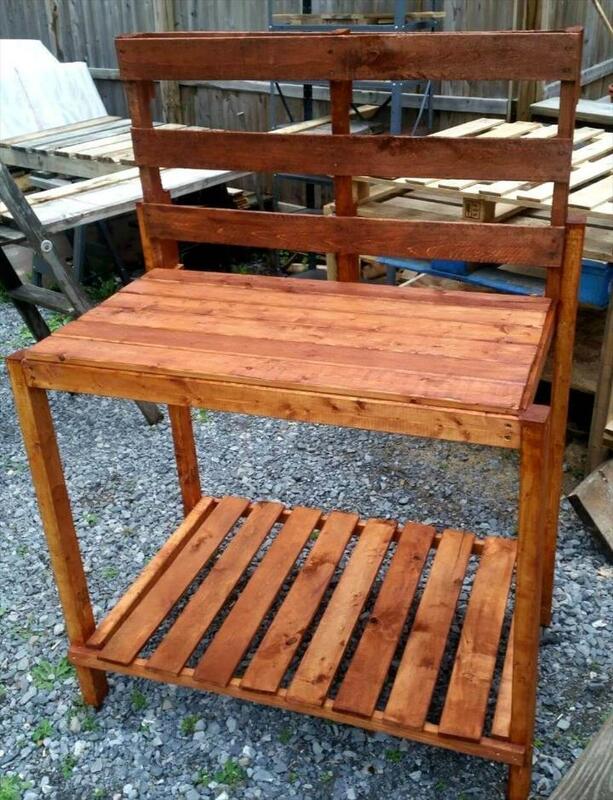 Here only 3 slats of pallets have been put flat across the leg beams to give a lasting lower shelf to this potting bench! Add nails to hold the planks in place! 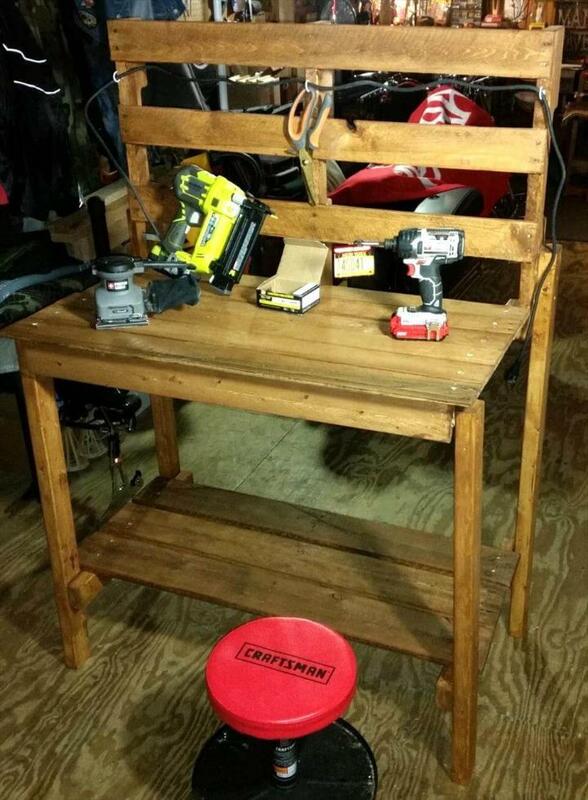 Add clamps to your potting bench that will hold the electrical wires there if you need to operate some power tools there for instant garden repairs! 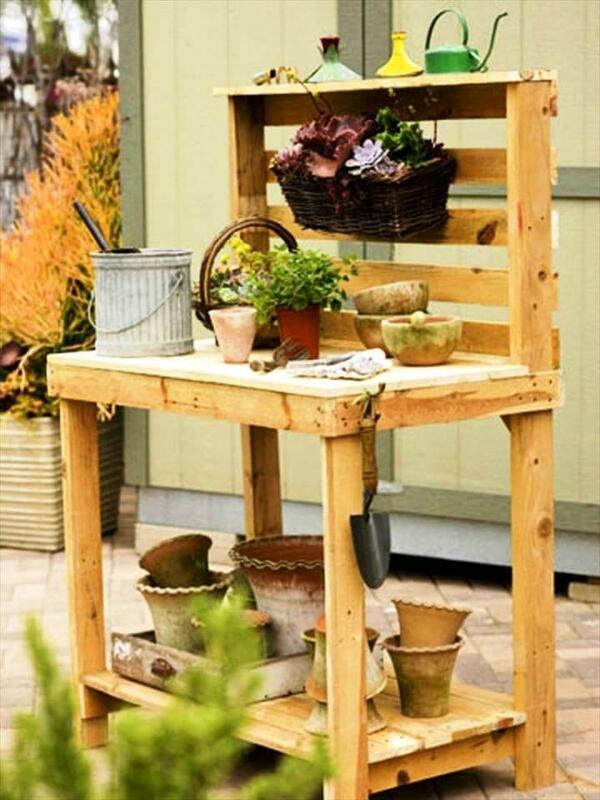 Here is one more wise inspiration of pallet-made potting bench, comes with additional metal hanging hooks and also with a top shelf! 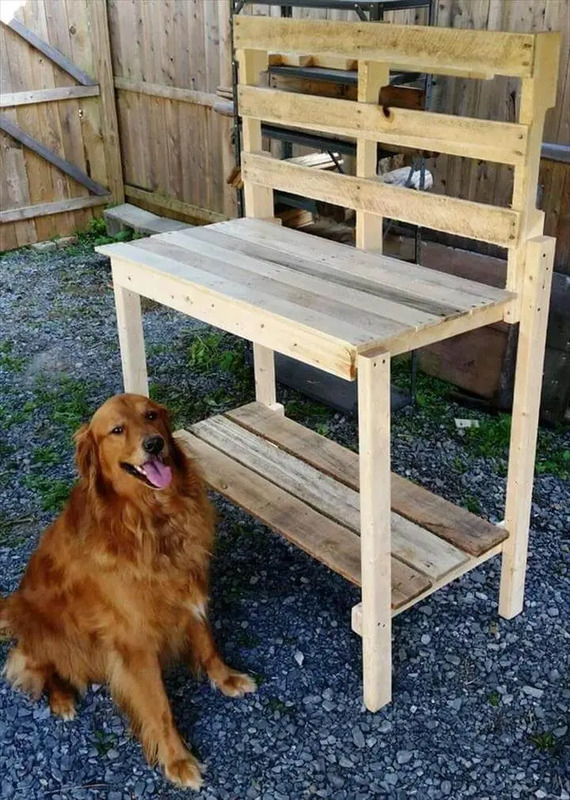 Another rustic design of potting bench, installed with rustic pallets, can be added with more features and also with amazing hanging and storage solutions! 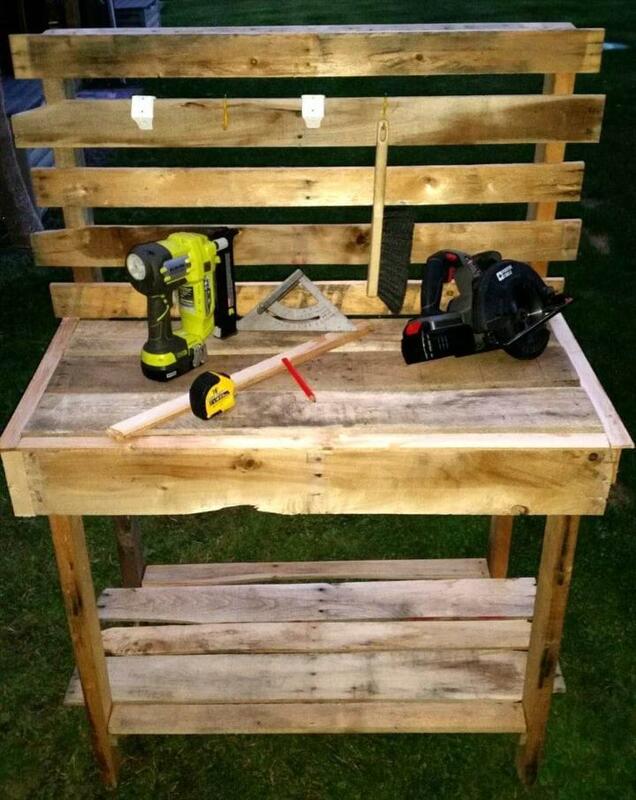 We showcased this project only to get you inspired of some amazing uses of pallets that assist you in gardening! 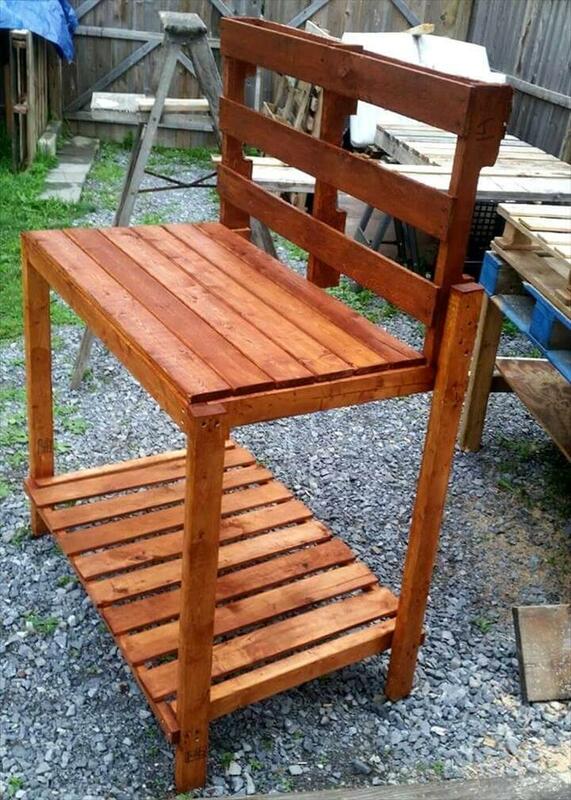 We hope that building a potting bench out of pallets will not be a difficult task to do for you!